Cholera is a severe intestinal disease that is caused by the bacteria Vibrio cholerae. 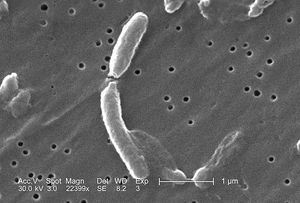 This bacteria can be found in many places such as polluted water and tainted fruit. Cholera is not a very big threat in the United States but in many third world countries such as South Africa and Peru, Cholera is the cause of many deaths. Around 80-90% of those infected with Cholera do not develop serious problems and those who do develop serious symptoms is less than 20%. There are many symptoms that show evidence of cholera in a person. These symptoms can also be divided into three stages and those stages represent whether the patient is in the beginning stage of the disease or the recovery. Stage One - The first stage of cholera is normally called the "Diarrheal stage". The symptoms evident in this stage are vomiting, rice-water stools, muscle cramps and watery diarrhea. There symptoms are quite common during the beginning of the disease and the diarrhea maybe severe but it is usually painless. Stage Two - Stage Two is the "Dehydration state" and includes the following symptoms: Dehydration, cold skin, sunken eyes, thirst, weak pulse, voice changes, shock, reduced urine, muscle cramps, and muscle weakness. The voice changes in this stage result in either a faint or high-pitched voice and the reduced urine and thirst is a result of the dehydration one experiences during this stage. This is the most severe stage of Cholera and if left unchecked and untreated may result in death. Stage Three - Stage Three is known are the "Recovery Stage." The symptoms in the Recovery Stage are Asymptomatic (when a sick person shows no signs of being ill), mile and/or severe diarrhea, loss of sodium, loss of potassium, loss of bicarbonate, electrolyte imbalance, intense thirst, reduced urination, hypotension (low blood pressure), hypokalemia (unusual low levels of potassium in the blood), Acidosis (an overload of acidic wastes in the blood), and kidney failure. 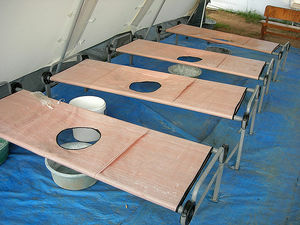 People affected by Cholera have continuous watery diarrhea, so beds have a hole with a bucket under, to facilitate the treatment which is rehydration. Doctors will go through many steps in order to correctly diagnose cholera. They will begin with asking the patient questions about the medicines they are currently taking, if they have traveled anywhere in or outside of the country, any foods they have recently consumed, and their current medical condition. The diagnosis is not limited to only questions. The doctor will execute a physical exam on the patient to look for any physical signs of cholera and any signs of fluid loss. If signs of cholera are visible on the patient the doctor will ask for a stool sample. The examination of the stool sample will help the doctor make a correct diagnosis. The doctor will look for Vibrio cholerae, the bacteria that is responsible for cholera, in the stool sample. Once the diagnosis is complete, the doctor can prescribe the patient antibiotics and give advice that will help rid the patient of his ailment. An alternate method to the stool sample would be a blood culture. The doctor would clean the area with antiseptic and then insert a needle into the patients vein and collect the blood into a vial and send the blood sample to the laboratory. The blood sample is placed into a dish where it is observed to see if bacteria grows. If no bacteria grows the procedure is over, but if bacteria does grow more tests will be performed to classify what kind of bacteria is growing in the blood sample. 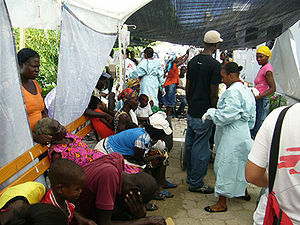 In pandemic circumstances, the doctor will prescribe treatment before any verification of cholera is found. All that is needed of the patient is for them to give a record of any symptoms they might have had and a short examination. The most helpful samples that can be used to diagnose cholera are the stool and swab specimens that are gathered while the patient is in the acute phase the the disease. The stool and swab samples are then examined to see if any Vibrio cholerae are in them. If none of these microorganisms are found in the samples they are sent to a reference laboratory for further examination. Cholera is a disease that is very easy to cure. Although if left unchecked and not immediately Cholera can lead to severe symptoms and may even result in death. If Cholera is treated during its early stages the symptoms and complications that accompany it may be reduced and the chance of Cholera resulting in death is falls under one percent. The selection of treatments one has are fluid replacement and antibiotics. Fluid replacement involves replacing the fluids and salt one loses through diarrhea immediately. The fluid replacement treatment is a solution of sugars and salts that is taken with water and drunk in big quantities. This is one of the most common and successful forms of Cholera treatment and is used by many people world wide when dealing with diarrhea. The other treatment option one has is antibiotics. This form is not as popular as fluid replacement as it does not fully treat the disease. All the antibiotics do is reduce the time and seriousness of the illness. Although this is one form of cholera treatment fluid replacement should not be overlooked and should be immediately administered to the patient. ↑ Cholera WHO.int, Accessed 12/14/10. ↑ Caues Mayo Clinic,Accessed 12/14/10. ↑ 3.0 3.1 3.2 Symptoms of Cholera Health Grades Inc., Accessed 12/2/10. ↑ Cholera Diagnosis Arthur Schoenstadt MD, eMedTV, Accessed 12/2/10. ↑ Blood Culture Accessed 12/2/10. ↑ Cholera Diagnosis Accessed 12/2/10. ↑ Treatments for Cholera Clinaero, Inc, Accessed 12/2/10. This page was last modified on 2 June 2016, at 10:21.